Nolan Gould (born October 28, 1998) is an American actor. He is known for his role as youngest sibling Luke Dunphy on the ABC sitcom Modern Family. Gould was born in New York City, the son of Angela and Edwin Gould. Shortly after his birth, due to his father's military career, he and his parents moved to Phenix City, Alabama. When Gould was five years old, the family moved to California. His elder brother, Aidan Gould, is also an actor. Gould is a member of Mensa, and as of 2012, had accelerated ten grades in school. He stated on The Ellen DeGeneres Show that he has an IQ of 150. During summer 2012, at age 13, he graduated from high school by taking a General Educational Development (GED) test and said he hopes to take online college courses. As of the 2014-15 TV season, Gould made over US$70,000 per episode for his role on Modern Family. Other television credits include Eleventh Hour and the movie of the week, Sweet Nothing in My Ear. In 2017, Gould was featured in the music video for Logic's new song, 1-800-273-8255, the number for the National Suicide Prevention Lifeline. Gould played a gay man alongside Coy Stewart as his best friend and ultimately his husband, Matthew Modine as Gould's dad, and Don Cheadle as Stewart's dad. Gould plays the double bass and banjo. He received his first banjo after appearing on The Ellen DeGeneres Show,[clarification needed] and as a result, started playing instruments such as the didgeridoo and mandolin. When he appeared on the show a second time, he said he was thinking of buying either a theremin or a sitar. 2010 Good Luck Charlie Zander Episode: "Sleepless in Denver"
2011 R.L. Stine's The Haunting Hour Jack Pierce Episode: "Best Friend Forever"
2015 Sofia the First Elliot Episode: "Substitute Cedric"
2016 Hell's Kitchen Himself (Guest diner) Episode: "When the Wall Comes Tumbling Down"
^ Modern Family Nation. Post at Twitter October 28, 2013. ^ Harvey, Alec. "'Modern Family' star Nolan Gould has ties to Alabama". Al.com. Retrieved January 22, 2012. ^ "Nolan Gould profile". TV Guide. ^ Gould profile, deardoctor.com; accessed September 17, 2014. ^ a b c "Nolan Gould Biography". Pop Tower. ^ a b "It's Evening in America", Vanity Fair. May 2012. Page 158. ^ Johnson, John (October 11, 2012). "Modern Family Star Nolan Gould Graduated High School Early at Age 13!". Us Weekly. ^ "The Kids Of 'Modern Family' Are Getting Huge Raises". Huffington Post. August 29, 2012. ^ "Movie Web Credits". Archived from the original on 16 December 2014. Retrieved 27 February 2012. ^ "TV Guide Credits". Retrieved 27 February 2012. ^ Gould, Nolan. "First day of shooting "Field of Lost Shoes". Reaching into my southern past to remember how to do the accent". Twitter. Retrieved June 3, 2013. 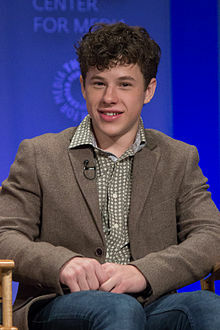 Wikimedia Commons has media related to Nolan Gould.